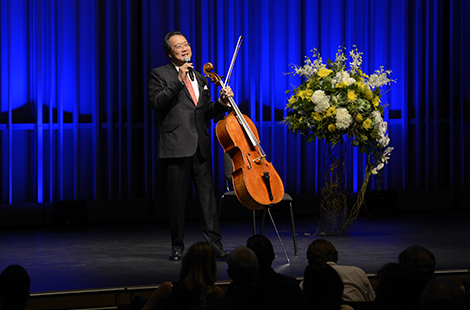 World-renowned cellist Yo-Yo Ma delivered a riveting performance to a crowd that included Rock and Roll Hall of Famers Smokey Robinson and Stewart Copeland at a gala benefiting the 4-year-old Valley Performing Arts Center. Read more about the VPAC gala. More than 10,600 students are expected to take a great step in their lives at CSUN’s 2015 commencement. Among these stories of success are multiple truly outstanding graduates who are elevating Los Angeles. Read more about CSUN’s outstanding graduates. The Department of Chicana/o Studies honored Luis Rodriguez, a native Angeleno and self-proclaimed “Valley Guy,” for his appointment as Poet Laureate of Los Angeles. Read more about Luis Rodriguez. Fri., May 15, 5:30 p.m. Tue., May 19, 7 p.m.
CSUN President Dianne F. Harrison received the Trailblazer Award from Leadership California along with five other CSU female presidents in recognition of their groundbreaking achievements and leadership in academia. The CSUN Sports Network multimedia platform will create and showcase extensive video content and more on GoMatadors.com and the Matadors’ social media handles, expanding the ways in which fans can interact with their favorite Matador teams. CSUN students presented a series of innovative mobile applications in an entrepreneurial environment with the goal of improving future life at CSUN.